Although global scale economic impacts are important, especially for consumers tied to global markets, local and regional deviations from global trends will also be of interest. In particular, one may wish to know how production will change in areas where the ability to purchase food on global markets is more limited, a situation that characterizes many of the poorest areas in the world where subsistence agriculture is common and local prices respond directly to changes in local production. Uncertainties in crop yield projections often increase as the scale of interest is narrowed, in part because climate models diverge more in their projections of temperature and rainfall at regional than global scales. It is therefore difficult, for example, to say whether impacts will be worse in one country than another. None the less, some general patterns emerge in most impact assessments. First, crops grown today in warmer (tropical) latitudes tend to fare worse in a warmer world than crops grown at higher latitudes. 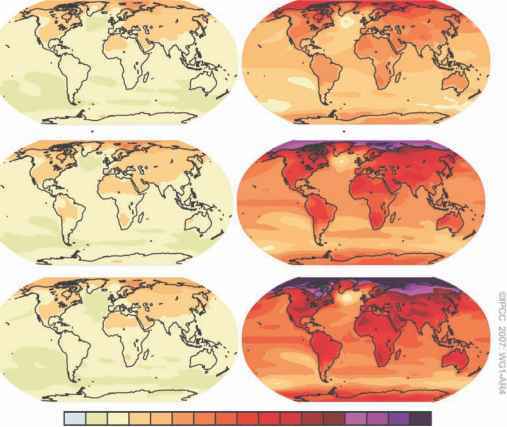 Thus projections for countries such as Canada and Russia usually indicate net positive impacts of climate change and elevated CO2, while projections for many developing countries are negative. Secondly, those developing countries with particularly hot growing seasons, particularly sensitive crops, and/or particularly dire rainfall projections tend to do worse. A recent assessment of impacts by 2030 (Lobell et al., 2008b) pinpointed southern Africa and South Asia as two such regions, and argued that substantial investments in adaptation would be needed for these two regions to avoid serious negative outcomes. In the case of southern Africa, maize yields were projected to fall by an average of 30% by 2030 from a combination of higher temperatures and drier soils.